This is the new Poly Hat. 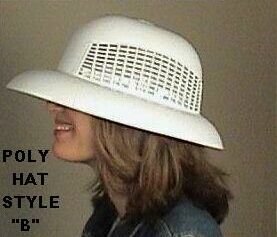 Basically made from white plastic, this type of hat will endure longer than the Canvas type. It repels water well, can be abused more without getting damaged as easily and can be maintained since it is more “washable”. This can be important if you are applying pesticides while wearing this equipment.